You are welcome to make payment for your numbers directly into the dmClub/Tangerine Telecom Ltd bank account if you wish. 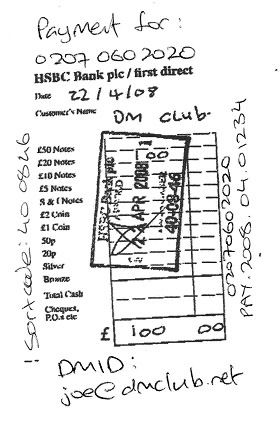 *Please note that we do NOT accept cheque payments drawn on bank accounts held outside the UK. 7 Make a note of the PAY reference number (eg PAY.2008.05.01254) of this payment, youll need it later on! Scan/digitally photograph the receipt , add it to an email as an attachment, and forward it to support@dmclub.net. Note: it is OK to take a photo with your phone and send us an email, but do not forget to include all the details, otherwise the payment may be delayed while we are checking that it goes to the right account. Remember that if you run out of room on your payment slip, you can always place the slip onto a backing sheet of paper and write your details onto the sheet instead of trying to write it all onto the slip! Hi I have just made a transfer to your Bank Account, please can you credit it to my account. Your clubhouse account balance will be credited within 4 business hours of us receiving valid notification of your payment, and verifying that the funds have been credited to us. Please note that if your notification is illegible or unclear, or is missing information, then the processing of your payment may be delayed. Please do not hesitate to contact our support team on +4420 7060 2000 if you have any queries regarding this process.